I have a new feature for Mondays, on the blog, but I’m going to save that for tomorrow. I know this is a nutrition blog but our focus, at Foodtrainers, is on wellness. And it’s hard to feel well with what’s going on. On Saturday, hibernating from the nor’easter that wasn’t, I was puttering around the house, goofing around with my Halloween costume and decompressing. I texted a few friends and then set my phone to charge. Hours later, I returned to my phone. “I’m sick about Pittsburg” a friend wrote. And then I learned what had occurred. That shaky, unsettled feeling came over me, thinking about people going to temple on the weekend, perhaps themselves seeking solace, at this crazy time. Saturday night, our friends were having a Halloween party. We had costumes, we were going out, even if we didn’t feel up for it. 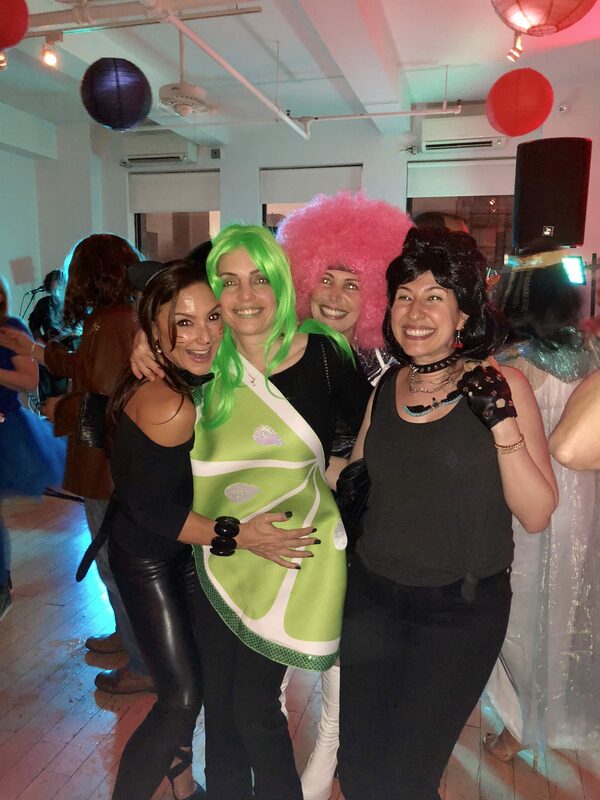 Marc put on his tequila outfit, I donned my lime getup, we took a few silly pictures and made our way to the party. On our way downtown, Marc asked, “so why are they having this party? Is it one of their birthdays?” I explained it was just a fun Halloween party, there was no other reason. When we arrived, I spotted my friend, one of the hosts, in a giant pink wig, silver sequin dress and white go-go boots. At the bar, other friends were impressively outfitted as Game of Thrones characters chatting with “Studio 54” friends. A band played classic rock and waiters had trays of food, Jell-O and Fireball shots. It was fun. Midway through the party, my pink-wigged friend came over to me. At some point in our conversation she said, “it’s nice to have a few hours to get away from everything that’s happening.” I hadn’t realized that but boy, she was right. I cannot be the only client who is having difficulty this week making smart food selections and adhering to sensible quantities. The news is unnerving: mail bombs; the stock market on a daily roller coaster; anti-Semitism and a mass shooting at a synagogue; stupid and venal utterances from Washington. If you have some tips to offer in your IG posts to get this back under some semblance of control it would be greatly appreciated. I didn’t respond right away. When an email is important, I like to mull things over before spitting something back. After thinking about this, I realized that as much as I am the poster child for homebody-ism, going out, doing something different left me feeling better than I had, in a long time. And though I get two newspapers a day, and like/need to know what’s happening, conscious breaks, from the news, are helpful. In terms of nutrition, I never miss a day of magnesium. And vitamin D is crucial for mood. Soups (Carolyn posted one of our faves on Instagram), healthy carbs-sweet potatoes and winter Squashes, warm drinks such as matcha and golden milk and a little dark chocolate provide healthy, comfort. I will not lie, it’s a scary, uncertain time. As I think back to Saturday night, there was a reason our friends had the party. We all need a little escape.